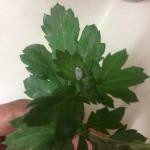 A calcareous cocoon-like structure was seen on my Chrysanthemum leaves. I plucked and tried to foldscope it using time-lapse. But the shell dissolved a few hours later and I could only observe the structure of the shell. 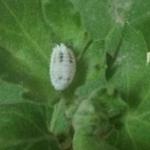 Is it a shell of a nematode or an insect ?